The second wave of half term hits the airports this weekend, who is dreading the flight with their little ones? Charlotte Clay, the founder of Vacation Nannies and experienced in-flight nanny has put together some top tips to help you prepare for your journey. There’s no such thing as being over prepared when it comes to flying with kids! I have travelled internationally as a holiday nanny and will confirm that you can never be over prepared for a flight. Whether short haul or long haul, being organised and prepared for every eventuality pays off! Firstly, the choice of bag! Keep your hands free by using a backpack rather than a shoulder bag or pull along. This makes it easier at passport control and pushing the buggy etc. I would recommend packing more than enough nappies/pull ups, just in case your baby decides to have an unexpected ‘poonarmi’ or to avoid the panic of your older child having an accident on board whilst the seat belt sign in on! Wet wipes, as we all know wet wipes are a saviour! Depending on how many children you have, pack at least one full pack. Not only are they handy for freshening up, they are also useful for wiping down surfaces and spillages, etc. Plane food is pretty revolting, so pack a bag full of snacks and food incase they don’t like their meal, you don’t want a hungry child on the plane! Depending on your snack rules, which I find are often broken on travel days, a top tip for avoiding ear pressure would be to let your child have a lollipop, this will help to avoid any earache on take off and landing and also a good way of bribing them into sitting in their own seat. I’ve also travelled with parents who sometimes hide their child’s favourite treat, which they have chosen, in their bag! After all, happy children equals happy flyers! As well as snacks, children need in flight entertainment. Small (quiet) toys, puppets, books etc are great for babies. For older children colouring books, sticker books, magnetic snakes and ladders and good old fashioned games such as eye spy are my favourites. It’s also a nice idea for the kids to have had some pocket money to buy themselves a new sticker book for the journey, that way it’s nice and exciting for them. However, we all know how well a screen works, so make sure the tablet (and portable charger) has lots of favourites downloaded and the headphones are to hand. I’m going to pass on a great tip from a Mum I travelled to the Caribbean with, I was the nanny for her four girls, ages 13 months to 7! All full changes of clothes were neatly folded into large resealable food bags, which acted as vacuum packs. These slim line bags were named and neatly ‘filed’ into the bag making them easily accessible and flat. For babies, I would pack more than enough baby grows and cardigans, making sure they are clean, comfy and warm/cool enough. If your child has been feeling unwell, make sure all medication such as Calpol, ear drops and any inhalers etc are to hand. Also, flight attendants are highly experienced with dealing with unwell passengers, so make them aware if you are worried about the health of your child. I recently flew to Thailand with Emirates and they were immediately on hand when a child fell ill. Depending on the ages of the children, I was once advised by a well travelled Dad to minimise the kids hand luggage. Yes, it’s great to let children pack an exciting plane bag, but when you have 4 children, you could be at risk of them packing all sorts and you ending up carrying it! Keep it simple by packing one backpack with all the kids entertainment in. Make sure you have checked in online and printed off the boarding passes to make it easier when you arrive at the airport. It seems that the only way of sitting together these days, is by pre booking, so make sure you check your airline. If you are flying as a family allow plenty of time for traffic, emergency toilet stops, nappy changes, toddler meltdowns.. You name it and I’ve probably witnessed it! There is nothing worse than any additional stress on travel day. You might be desperate to get to your final destination, but 11 hours on a flight with kids could quite possibly send you and fellow passengers crazy! Stopping for a few hours makes a good opportunity for the you to stretch your legs and the kids to make use of the play area and burning off some energy. The flights are also often cheaper when you stop on route. Travelling with children can be stressful, so please also make time for yourself by trying to get a good nights sleep, staying hydrated and making sure you also have some good in-flight entertainment. Do you think you might need help? 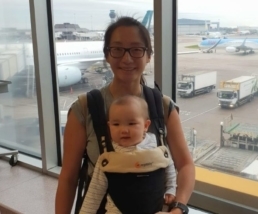 If the idea of travelling with your child or baby is too stressful, we have specialist nannies who are highly experienced travellers. They can either accompany you for the duration of your holiday, or be hired as your in-flight nanny. Please email Charlotte for more information on this tailor made package.